Mark DiMassimo: Welcome to the Inspiring Action show. This is your host, Mark DiMassimo. I met today’s guest on a United flight from New York City to Denver many years ago. I was traveling to meet a particular challenging client and frankly I was really concerned about the meeting. I introduced myself to my seat mate as he got settled and the conversation took off like a rocket. I soon discovered that I had several of his books in my library and I decided to put away my laptop and take advantage of three uninterrupted hours to have a conversation. What a conversation it was. I’m glad I did because he shared with me, at 30,000 feet, an insight about my Denver client that inspired me to take a completely different approach at the meeting. The result, instead of a difficult, fruitless discussion, it was the most successful meeting ever and I was able to inspire them to see our ideas in a new way so that they made a new decision that created new success for them. Mark DiMassimo: I personally experienced what this guy can do to help inspire customers, take action. He changed things for me and that’s why I’m such a believer. I’m delighted to have Mark S A Smith on our program today. He’s a sales and marketing guru helping people move from darkness to light in the world of business and he’s co-authored three books with “Guerrilla Marketing” author Jay Conrad Levinson. One of my true heroes, Jay Conrad Levinson, author of “Guerrilla Marketing”. You may know, my agency has won quite a few Guerrilla Marketing awards. We just love this guy. One of the books I have that Mark co-wrote, “Guerrilla Selling”, fantastic. [NOTE: Mark accidently mis-spoke, Mark S A Smith co-authored “Guerrilla Trade Show Selling” and two other Guerrilla books] He’s written many more books for specific technology niches and custom books for clients and it’s funny. He has a degree in electrical engineering but for the past 25 years, he’s co-owned and operated a marketing company focusing on helping companies launch disruptive products and services. The secret to selling disruptive products is inspiring new actions in the market, so his expertise matches our mission for this Inspiring Action program. Mark DiMassimo: Today we’re going to talk about how to inspire sales action, getting customers to make decisions. Mark, welcome to the show. Mark DiMassimo: That’s right. That’s right. Mark DiMassimo: Absolutely. I’ll tell you, you maybe were seven words in and I remember thinking, “Oh boy, I think this guy may have what I need,” and, boy, did I need. I really thought that my client relationship there was on the verge of ending. By the way, this is one of our longest term, happiest client relationships now. I just did not understand why we were getting so much negative feedback through our work. We were just very used to, we worked so hard, we cared so much. We were really so used to clients standing up and clapping like [inaudible 00:03:52] at our work and this is a client who really was poking holes, looking for every problem in our work and I just did not have the conceptual tools to understand what I was dealing with and, man, you did. Mark S A Smith: I’m grateful that you’ve been so successful and perhaps on a future podcast we can talk about that particular event and the strategy I shared with you. 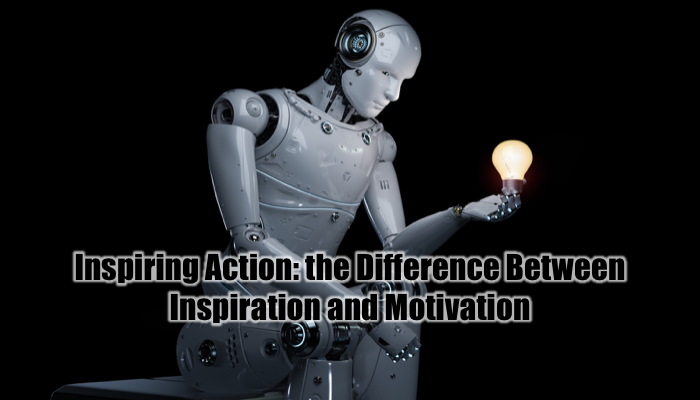 Today, what I’d like to do is talk with you about motivation and inspiration, why they’re different. Let’s talk about inspiration. I’ve been inspired by your podcast to really dig into this concept and put some words into play. I’ve been a professional speaker for 25 years but people say, “Are you a motivational speaker?” No, not really. It’s not how I look at it. The reason why is because inspiration is being mentally stimulated to feel or act in a new way, preferably creatively. The concept on inspiration is to help people become creative. Of course that describes you, describes your team, describes your company and that’s why I think this podcast is so important for our audience. Mark S A Smith: The thing to keep in mind … yeah. Mark S A Smith: Yeah, I’ve been doing this a long time. Mark DiMassimo: Is that what you said? Mark S A Smith: That’s it. That’s right. What I tell people is getting motivated is only a piece of it but what you really want is to have sustainability. Inspiration’s internal like you take a breath. You inspire. It’s all within you. It’s the influence of a higher power. It transforms how we view the world. It creates a more resourceful state. In fact, if I can’t inspire somebody to be more resourceful after our conversation, I haven’t inspired them. The word inspiration implies divine guidance. While frequently it’s a taboo to discuss divinity in the world of business, the reality is that all of this has some connection to a higher power, even those of us that say, “No, there is no god.” Still we know there’s something bigger, there’s something vaster out there that we connect into when we stop and that’s the idea behind inspiration. While this idea might be a little bit shocking, inspiration is rooted in love. Stay with me. I intent to explore that idea with you in this program. Mark S A Smith: Don’t get freaked out but that’s truly it. The idea is shocking. Motivation is external. Mark DiMassimo: Help me. I’d love to go deeper into this and I want to tell you frankly that I think of myself as an inspiring guy, as somebody who’s very good at persuading people to feel more resourceful and to become more themselves, people in companies and all of that. I’ve had some situations where I’ve been stumped lately where I could feel that I was dealing with, let’s say, a team that had taken a lot of hits and they weren’t feeling resourceful and they weren’t letting in the inspiration anymore. They weren’t playing anymore. I suppose I felt threatened by this because when they can’t play and they can’t perform, that’s anxiety for me and so I felt very moved and motivated to see what I could do to help them. I guess what I wanted to give them was love but I didn’t have a clear idea of exactly how I might deliver it. What would you say about a situation like that? Mark S A Smith: Let’s dig a little deeper before we come back to that situation and the reason why is I want to give you a platform to self analyze. I don’t want to troubleshoot it. I want to give you the tools to troubleshoot it. Mark S A Smith: That’s what we do as inspirational people. We give people tools versus … We teach them fish and then sell them a lot of beer. What I want to do is share with you a model that really helped me get inspiration in a whole new way. It’s a model you already know about. You’ve used it for years and yet I want to show it to you in a new way that allows you to use it as a whole new tool to implement inspiration. That is Abraham Maslow’s hierarchy of needs. Mark S A Smith: If you think about Abraham Maslow’s hierarchy, we’ve all learned this stuff. We learn it in marketing. We learn it in psychology and a lot of people go, “blah, blah, blah, Maslow’s triangle.” It’s really not a triangle. It’s not a pyramid. It’s a hierarchy of needs. Just to do a quick recap, there’s five levels that he talked about, physical needs, safety, love and belonging, esteem and self actualization. If you think about those five levels, where can inspiration occur? Can it occur at the physical need level? Not really. Mark DiMassimo: I would say not really, although it can occur if that level is not fed, right? Mark DiMassimo: That was something Maslow said, right? Mark S A Smith: It becomes motivation versus inspiration and motivation’s external. Mark DiMassimo: I see. I see. I see. Mark S A Smith: Inspiration’s internal. Mark DiMassimo: Got it. Got it. Mark DiMassimo: Inspiration is internal. Motivation is expiration. Mark S A Smith: Yes. That’s right. It’s external. That’s right. Safety, again, for people at that level, they can only be motivated. They can’t be inspired. It’s only when we get to the upper three levels that inspiration’s even possible. Love and belonging, so my initial position is that inspiration is rooted in love. Love and belonging, there we can start to inspire people to belong to something bigger than them. We can inspire them to love their family and to love their country and to love their jobs, to love their customers. Then we get esteem. That’s about loving yourself. Mark S A Smith: Right? That’s about inspiring yourself to esteem and, at the top, self actualization. That’s loving bigger than who you were in the past to be bigger in the future. Inspiration occurs at the top three levels of Maslow’s, motivation the bottom two levels. Given that, could you assess your situation and say, “Did your team have some issues with the hierarchy of needs where they were uninspirable because of something going on politically or something going on physiologically”? If somebody was sick, if there’s a lot of fear in the organization, inspiration’s just not possible. Mark DiMassimo: … six times to connect. Mark S A Smith: That’s an esteem problem. Mark DiMassimo: They needed to sleep and eat and recover before they could be inspired. Mark S A Smith: That’s right. See, people have to have the lower level of hierarchy in place and cared for before they can become inspired and you may have to progress them up the hierarchy to be able to inspire them. This implies that they have to feel physically comfortable, safe, part of the group and held in esteem before you can inspire them to something beyond and bigger. Just to recap, I believe that the top three level of the hierarchy are based in love, love of others, love of self and love of life. In my experience, you can’t inspire without loving those who you inspire and loving the idea that you’re sharing to inspire. Mark DiMassimo: 17 times a day. Mark S A Smith: That’s right. There you have it. Mark DiMassimo: Love it. Love it. Mark DiMassimo: Love, love, love. Mark S A Smith: That’s it. That’s it. That’s it. That’s what allows you to tap into that energy that passes it onto somebody else and they want to be a part of it. The politician’s downfall, Mark, is you can’t inspire those who you hold in contempt. Mark S A Smith: If your team is looking at a client that they go, “They’re a bunch of jerks,” there’s no way you can inspire them. I’m sure that you’ve fired clients that you couldn’t feel inspired about because they’re uninspirable. You cannot do this. It’s the same thing for parenting. You can’t parent children if you hold them in contempt. You can’t inspire anybody who you hold in contempt. You have to have the capacity to love them and want them to be bigger than they are to inspire them. Mark S A Smith: That’s true. Mark DiMassimo: … are defending themselves with contempt. Mark S A Smith: … because contempt helps keep them from engaging in something that they see as being unsafe and I want to talk a little bit more about that particular concept in just a couple of moments when we talk about what is it that holds people back from inspiring or being inspired because there is an element there of fear. I don’t want to get into that but I want to get back to Maslow’s hierarchy for just a moment, unless you have a comment to add. Mark DiMassimo: Sure. No, no. Sure. Mark DiMassimo: I’m going to try to get us into marketing and talk about agencies and sales as well, too, but I am fascinated by … You’ve taken something that was just sort of like the wallpaper behind the wallpaper, Maslow’s hierarchy, and you’ve brought it back to life for me so I am riveted. Suddenly I feel like, oh, now I know what to do in those situations. I’m having the same kind of feeling of epiphany that I had on that airplane where, wow, now I have a tool that’s going to make situations that did not make sense to me make sense. I want to hear you take this to its completion, please. Mark S A Smith: Sure and I want to add another layer. While many people are familiar with the idea of Maslow’s hierarchy, what most people don’t know is this part of Abraham’s work. When people get frustrated when attempting to satisfy a higher need, they regress to a lower level of need until they find satisfaction. For example, people need esteem more than self actualization. That’s where inspiration is. When you inspire, you can’t inspire too high, otherwise people get frustrated, and you have to support this with them belonging and esteem. People have to see that what you’re offering to inspire them is within their reach. What this also implies is that you have to be at the self actualization yourself to inspire others. You can’t do it if you’re not a fully baked person or if you’re a sick person or if you don’t have your needs taken care of. This means you have to work on you if you’re going to work on others. Mark DiMassimo: You put the oxygen on yourself first. Mark S A Smith: That’s right. Yes. Mark DiMassimo: Okay. Yes. Wow. Mark S A Smith: Oh sure. Mark DiMassimo: Yeah, very interesting. Mark S A Smith: Sure. Frustration could be something … That’s right. Let’s go out and get a dessert because I can satisfy that physiological level or I’m going to lock myself in my office for a while because that’ll help my safety level. I’m going to pet my dog because that helps me with my belonging level. They’ll work their way back up because it’s easy. They know how to satisfy their needs at those lower levels. Then they can satisfy some of the frustration before taking another run at a higher level. Mark DiMassimo: Makes a lot of sense. Mark DiMassimo: Recognize people by name, that’s belonging, right? Mark S A Smith: That’s exactly right. Then self esteem, we’re really glad you’re here. You do a lot of things to recognize your team, the awards on the wall. Then you have musical instruments. Mark S A Smith: That’s part of that self actualization. You give people the ability to draw and paint and to create and to sing and to dance. That’s all those levels. Your organization supports all of that so people can be inspired at all those levels. Mark DiMassimo: It’s fascinating for me because we have long since decided that our culture is built on three values that underpin this idea of inspiring action and one of them is love. I never really understood why we just felt that love was in the air, love was what it took, love was what it was about. It felt right to us, even though it’s not the sort of thing, sort of like what you said about the divine, the higher power stuff. It’s not the sort of thing you talk about in a business context comfortably, right, or that most people do. It’s not an advertisement we make for ourselves. You’re not going to get a note from us in the male that says, “Hire us because we’re all about love,” at least you weren’t going to get one of those. We have felt that way and now I understand better why it works, why it’s essential. Mark S A Smith: Yes. The underlying concept, the underlying idea behind inspire is love. You don’t necessarily have to be overt with the word love other than I love that idea, I love our clients, however you choose to express it. Unfortunately in our society, saying, “I love you,” to somebody who you’re not married to, somebody who’s not part of your inner circle, you’re kind of looked on as being a little weird, although I tell people I love them all the time. It’s my expression to them. Mark DiMassimo: I say I’m basically an Italian American guy so I’m allowed. Mark S A Smith: You are allowed. Mark DiMassimo: I have my thing. The fact that I throw out that disclaimer from time to time means that it’s not exactly normal. If I was worried about being normal, there’s a lot I wouldn’t be able to do in my life. Mark S A Smith: That’s why you’re the president of your company. You get to do it your way. Mark DiMassimo: Yeah. That’s right. Amen. It’s good to be the king. Mark S A Smith: It is good to be king. Let’s talk about why you want to inspire. I think that’s an important component. We just talked about what inspiration is and kind of put a model around that but why do we inspire? The reason why I do what I do is to transform people. I mentioned that at the beginning of our conversation. To me, the transform, it’s the buzz. It’s why I do what I do. I would speak for free. Don’t tell my clients that but I would speak for free because of the buzz I get out of taking people to a new place that’s more resourceful. People are different after they’ve found a more resourceful attitude or more resourceful ability or more resourceful action because of inspiration. Inspiration can do all three of those. Attitude, ability and action and in our particular conversation it’s inspiring to action. It can also be attitude or ability, which enable action. They’re transforming. The world is a different place. Mark, you are a different person than you were 30 minutes ago because of a conversation around Maslow’s triangle and inspiration. Mark S A Smith: That’s inspiration, my friend. That is transformation. Quite frankly, you inviting me on this show created transformation because it caused me to stop and to put into words some of the things I haven’t done before. You and I as colleagues have a different level of conversation than I have with an audience. I’m not going to show them the secrets behind the curtain unless they hire me to do that but you and I, we share our secrets. It’s what we do. Thank you for that change. Mark DiMassimo: I have to go back to that original conversation on the plane because I’ve been living the results of that conversation and the tools you gave me at 30,000 feet. As a result, not only do I have a great relationship with this client but you opened up for me an entire world of clients, maybe 35% of the people that I could work with that I didn’t understand how to work with before. They just didn’t operate in a way I understood and, therefore, I was destined before that conversation to have difficult and frustrating relationships with these people. After that conversation, not only am I able to have good relationships with those people, inspiring relationships with those people, productive relationships, but I also walked into every conversation with a higher degree of confidence and resourcefulness because I know that I have the tools for dealing with different kinds of people effectively that I did not have before that one conversation. That’s how transformative this can be. Mark S A Smith: Yes, it can. The good news, it doesn’t have to be that big of a transformation. Mark DiMassimo: Don’t go away. This is very pragmatic. It’s very practical. Mark DiMassimo: Very down to Earth. This is nothing too crazy. Mark S A Smith: Keep in mind I’m an electrical engineer by training. Mark DiMassimo: … of an electrical engineer. Mark DiMassimo: Yes. Yes. Pursuit of happiness. Mark S A Smith: …. a lot … That’s right. The pursuit of happiness is to inspire others to transform so you get happy. That’s why I love to inspire. Mark DiMassimo: You’re saying that’s not just you and me, that that’s something that’s built into us as human beings, that we get to sort of a certain level of that hierarchy and then we get a charge out of transforming others? Mark S A Smith: That’s right. We get a charge out of inspiring others to transform. We don’t transform others. Mark S A Smith: We inspire them to transform. Mark S A Smith: Remember, inspiration is internal. I motivate others but the moment that I remove that motivation, they may go back to their old ways. Mark S A Smith: The idea behind the transformation is it’s a change that is permanent. Mark DiMassimo: … talk a little bit about the role of marketing in an agency like ours and the function of sales. In short, how do you view marketing in creating inspiration to take action? Mark S A Smith: Yeah, yeah. Let’s talk about that. There are six elements that are required for any business to be successful, every business to be successful. You have to have a product that creates value for our target market. You have to have a marketing that inspires conversation. In my opinion, marketing is all about having a conversation with somebody. If marketing doesn’t inspire a conversation, in your particular case the action you want people to have is a conversation, then it’s not marketing. It’s a waste of money. That’s Jay Levinson’s, you know. Marketing has to create action as a guerrilla. Mark S A Smith: Then the third thing we have to have is sales that inspires a transaction. If we can’t get our sales to have a transaction where we trade money for services or goods, it’s a waste of time, it’s a waste of resources. It’s always about inspiring that transaction. Fourth thing is customer service that inspires loyalty. We don’t get loyalty until after a customer does business with us. It’s the customer service that’s going to inspire that attitude and those actions to have loyalty. If we don’t have a good solid customer service, then all that work we do at the front end with marketing and sales is going to get drained way as the customers leave us as fast as they come. Mark S A Smith: The fifth thing we have to have is something that you have done extremely well. In fact, you are my model of this and that is culture that inspires an unforgettable brand. For example, your Digo culture document, is the best and you know I use that as the exemplar any time I do culture training. That is it. Mark S A Smith: I hold it up and say, “The best, this is it. I you want a model, use this as your starting point, such as this is a for-profit organization,” and everybody applauds. The idea is it inspires an unforgettable brand and my definition of brand is it’s a customer experience that people want to repeat, they can’t get it anywhere else, they’re willing to pay for, they’ll tell their friends about. That’s what creates a valuable brand. Mark DiMassimo: What’s … Oh, go on. Mark S A Smith: The sixth thing is infrastructure that supports scaling and growth. That’s kind a physical type of thing but notice that five of those elements are going to create something inspiration. If the product is disruptive, it’s going to inspire a new world. Marketing has to be inspirational, has to be, to create those conversations. Sales has to be inspirational to create those transactions. Customer service has to be inspirational to create loyalty. Culture as to inspire a unforgettable brand. Mark S A Smith: That’s how I see inspiration permeating an organization. Mark DiMassimo: What do you say about the trend of mind that seems to attempt to collapse all of those levels down into the product? In other words, and I won’t repeat it back to you as perfectly as you said it but in other words, think about Google. A product that not only delivers an incredible service but is inherently word of mouth, engagement and share-worthy, connected to a brand name, it’s a self-cleaning oven, sales is not necessary. Marketing is not necessary. What do you say to that point of view? Mark S A Smith: I say that that will work if you create a disruptive enough product that people are willing to tell their friends about, can’t get anywhere else, are willing to pay for. It gets back to that brand statement. It has to be disruptive and the reason why we use Google is because it is disruptive. Mark S A Smith: It is completely disruptive and Google is absolutely inculcated in my life and it knows all about me and I’m really glad it does because it makes my life seamless. Mark DiMassimo: Mark, Mark, could you give us your definition of disruptive for our audience? This is a word a lot of people throw around and I just have the feeling that not everybody defines disruptive innovation or a disruptive product in the same way. Mark S A Smith: I’ll be glad to. Disruptive means that once you’re exposed to it, your world changes and you will not go back to the status quo. Mark S A Smith: The best example of that is five years ago, Mark, when you wanted to watch a movie, what did you do? When you wanted to watch a movie at home, what did you do? Mark S A Smith: Right, you went to Blockbuster. Mark DiMassimo: Went to Blockbuster, yeah. See, I forgot their name. Mark S A Smith: You went to Blockbuster. Mark S A Smith: Today when you want to watch a movie at home, what do you do? Mark S A Smith: 1,700 Blockbuster … That’s right. 1,700 [NOTE: It was actually 9,000 stores] Blockbuster stores no longer exist. That’s disruptive technology. Mark DiMassimo: That whole industry is gone. Mark S A Smith: That is disruptive technology. It took us a little time to make that transition from going down to Blockbuster and picking out a movie to doing it, although it happened fast. Another example of disruptive technology is the smart phone. You know, Mark, we’ve only had iPhones for seven years. That’s it. Can you imagine your life without a smart phone? Mark DiMassimo: Not really, although sometimes I like to think about it. Mark S A Smith: Keep in mind it’s there for your convenience. You can turn it off. Mark DiMassimo: Yes, I guess I know. I can but it’s hard. Mark S A Smith: You’re part of that offline movement so you know you could turn it off. Oh, no. You know the hardest part. Mark DiMassimo: It’s habit forming. Mark S A Smith: The hardest part is … What’s habit forming is this feeling that there is something bigger and better than where you are and who you’re with. That’s what’s habit forming. Mark DiMassimo: You would transform them physically. You would physically transform. Get out of my restaurant. Mark S A Smith: No more inspiration. Mark S A Smith: Back to the … I’m going to motivate action in that particular transfer. Yeah, you’re one of the leaders in the off-lining movement. Mark DiMassimo: That is true. I try. I try. Mark S A Smith: Yet that is the concept behind disruptive technology. Our company works with organizations that bring this to market. The interesting thing about marketing disruptive technology is you can’t talk about the product because, as Henry Ford pointed out, if I asked them what they wanted, they would’ve said, “A faster horse.” The reality is that in a disruptive world, you have to inspire a new world. I really love the concept that John Carlson, the famous copywriter, says is that our job is to walk people up to the door of the future, the window of the future and show them what’s possible on the other side. That is inspiration. That requires inspiration. Mark DiMassimo: You try to put your suitcase in the trunk of a horse and you could be killed. I haven’t tried it but I’m just saying. Mark S A Smith: You’ll get a real kick out of it, Mark. Mark S A Smith: That’s the disruptive nature of it. Mark S A Smith: That’s the disruptive nature. Of course, automobiles at the beginning of time looked an awful lot like carriages at the beginning. In fact, they were called carriage works for quite a while. Mark DiMassimo: That’s right. That’s right. Horseless carriages. Mark S A Smith: Mm-hmm (affirmative). That’s that transformation that people go through as we bring disruptive technology to market. You and I are involved in that process. Mark DiMassimo: What holds customers back from making decisions and how can we inspire them? I guess this is from the marketing communicator, from the interactive advertiser point of view, where do we apply the leverage and how do we apply it? What holds them back and how can we inspire them? Mark S A Smith: All right. Great. That’s a good question to ask. It ends up that it’s easy to inspire people that are creative because inspiration is creative. We inspire creativity. Not so much if creativity isn’t a part of their DNA. Part of what we have to understand is there are going to be groups of people we can inspire, groups of people that we cannot. Motivation doesn’t go away. The need for motivation does not disappear but what happens is that we need to understand when we need to apply that external motivation and when we can apply the internal inspiration. It’s going to be where we are on a Maslow’s triangle and quite frankly, Mark, here’s an insider’s secret. You may want to edit this out of the program so that your competition doesn’t know this. When you’re selling physiological needs and you’re selling safety needs, that’s going to be a pain based sale because it’s motivating. Pain is motivating. Pain is motivating. Mark DiMassimo: The Excedrin TV commercial, you know. Mark DiMassimo: Yeah. The drill to the head. Mark DiMassimo: That works. It works. Mark DiMassimo: It works for years. Mark S A Smith: It works. It works and trying to be inspiring at that level won’t work. Mark S A Smith: Let’s use the tool at the right level of what we’re attempting to bring into people’s world. There’s fundamental, from my experience, there’s three reasons why people aren’t inspired. One is what I’m talking about is not relevant. They don’t care. Just do not care, not part of their life, not part of their experience. Too far away from where they are, just too far outside of their field of vision. As we talked a little bit earlier, we have to increment people up to inspiration. You don’t feed a baby steak. It doesn’t matter how much you and I love a nice, rare filet with a lovely glass of okay cab, babies are not going to like that. Mark S A Smith: Too far. Mark DiMassimo: You don’t start a fire by lighting a big log. It doesn’t work. Mark S A Smith: That’s it. That’s right. From relevance standpoint, we may just be reaching too far. We need to maybe dial it back and more relevant. Seconds thing is fear. A lot of people can’t be inspired because of fear and there’s lots of sources to fear. They come from bad past experiences or somebody else has had a bad past experience, has told them the story. It can be fear of making the wrong decision, fear of being ripped off, fear of ridicule. Oh, look what you bought. Oh, what an idiot. Fear of loss, so if this doesn’t work out and I can’t get my money back, how can I recover from this? Fear of being authentic is an interesting challenge. You and I are authentic. We really don’t care what people think. It’s our business and if you don’t like us, go away. Mark S A Smith: Authenticity is a big issue. Authenticity is a big issue. It really is a big issue. A lot of people are afraid of being authentic. Mark DiMassimo: Sure, sure. Yeah, a lot of people, there’s a gulf between who they really are and who is required for the situation they’re dealing with, right? Mark S A Smith: That’s right. That’s it. Mark S A Smith: Maybe. Mark DiMassimo: … and it creates this stress. They may be right, they may not be right. Mark DiMassimo: They may be in the wrong situation or they may be mistaken but it certainly increases stress and people feel a lack of authenticity. Mark S A Smith: I think you’ve got a really interesting point there and I want to drive it home. Stress is caused by inauthenticity. Mark DiMassimo: That’s the E equal MC squared of this conversation. I think we are on to something, Mark. I really do. Mark DiMassimo: I think you’re exactly right. If you could be yourself, then you’re flowing. You’re playing. Yeah, you could get hurt. You could get angry. You could be frustrated but you’re not going to feel this existential stress. Mark DiMassimo: I try to make a fool of myself at least once in every meeting in order to give other people permission to just be themselves. I really do. Mark S A Smith: That’s great. I love it. That’s great. There you go. Authenticity, fear of being authentic equals stress. Mark S A Smith: Then the third thing that usually keeps people from being inspired is priority, matter of priority. Inspiration, I want you to think about this one. This is a chewy nugget. Inspiration is always about making somebody examine their priorities. Mark DiMassimo: Wow. Give me an example. Mark S A Smith: An example of that is let’s go back to something that you’ve done quite a while ago, which was the concept of Tappening. The idea is stop buying bottled water. Carry your own bottle from the tap so we can reduce waste, reduce fuel, all the really good reasons that you did in the world of Tappening. With the concept of Tappening, we are challenging people’s priorities of convenience. I’ll just pop over to 7-Eleven and pick up a bottle of water versus having to prepare for the day. For them, it could be a time criteria. Money’s not an issue because they have enough money to buy a bottle of water at an egregious amount of money. There is nothing fricking more expensive per gallon than a bottle of water. Coca-Cola’s cheaper and it’s just insane. Mark S A Smith: Just freaking insane. That inspiration, you cause them to challenge their priorities, examine their priorities, think about their priorities. There are four fundamental indicators of a person’s priorities: how to use your time, how to use your money, how do you use your energy and do you use a deadline? Is there a time bound in this to something that you’re going to do? In the world of Tappening, you’re asking for people to consider taking time to prepare, think ahead, carry water with you, money. You don’t have to spend as much money but for somebody whose money is less important than time, which a lot of people believe is true … I can’t make more time but I can make more money. Yeah, that’s true to an extent, yet we can also move the money to another priority. Then energy, what do I do with my energy? All of those elements create … Then you can create a deadline. Of course that’s what we do in the world of marketing is we generate deadlines so that people take action. Most people will not take action without a deadline. Mark DiMassimo: There is that, yes. I wanted to bring them up to speed on that because I’m aware that not everybody will know about Tappening at this point. “Good Morning, America’s” hot product of the year five years ago, so a pretty big thing in its day. Eric and I have moved on to our main focus being offlining these days, which is our movement and mission to just give equal marketing time to the off button and like Mark S A Smith said earlier in the show, we really do think meals present the greatest opportunity for building little islands of offlining time in your connected existence otherwise disconnected existence. Mark S A Smith: That’s right. Even if you eat alone, spend a little time with yourself. Mark DiMassimo: Yeah. Yes and experience taste and all of that. We are probably at about 45 minutes together here. We really should probably only go another five or so. Mark DiMassimo: I don’t want to miss out … Mark. If I were to ask you to come back and do another show and maybe another one again, has this been the kind of experience that perhaps made you feel inspired enough to do that? Mark S A Smith: Mark, you’re teasing me. Absolutely. I love spending time with you, pal. I’ll spend time with you any time, any place, anywhere just because every time we have a conversation, I’m inspired. Yeah. I’d be delighted to. Mark DiMassimo: That’s great. I just feel like I get so much clarity. I just know after a conversation like this I attack the rest of my day with a whole new level of confidence and energy. I would like to round back to sales. Mark S A Smith: Yes and I want to share what you can do about these things. Yes. Mark DiMassimo: Yeah, yeah. What can we get? For the audience, they want to go back to their world today feeling transformed and energized. What can they do with the stuff that we’ve been talking about? Mark S A Smith: Great. I’m going to go back to what holds customers back and how can you inspire them to do something? In my experience it’s been what holds them back is it’s not relevant so you can just be relevant, making sure that who you’re communicating with, who you’re connecting with are people that you can inspire. You can’t inspire everybody. Don’t waste your time. Don’t waste your self esteem. You can go out there and try to inspire people that are uninspirable. You’re not going to be relevant. It’s not going to work. Just don’t bother. It’s not worth your time. They’re not in a place that you can pull them up. Somebody else will inspire them, okay? They’re not your mission. Mark S A Smith: The second thing that we talked about was fear. Do everything you can to reduce the fear so that they can recover even if there’s some risk. Tell success stories that show that the reward is greater than the risk. We do a lot of inspiration through telling stories. You had a guest on recently, I think Ty is doing the story doing. Mark DiMassimo: … more doing. Mark S A Smith: Yeah. I love that concept. Tell success stories. Show success stories, that the reward is great than the risk as a way of helping people feel more comfortable in getting rid of fear. Take on the risk with them. Take on the risk for them. How do you do that? Guarantees, right? Mark S A Smith: We do that all the time. Money back guarantees, risk reversal guarantees are some of the things that we can do to provide that security layer on Maslow’s level of hierarchy to help reduce the fear so that they can be inspired. See how that fits, Mark, into our tool box of things that permit inspiration? If you can’t guarantee something, you’re going to have a limited number of people which you’re going to inspire because they don’t feel safe. Mark DiMassimo: You know what, this is the engineer. I just have to say this. This is where the engineer inspires in you because you’re just throwing words out there into the universe here but as you’re doing it, I see how the problems that we talked about, Maslow’s hierarchy, the insights that you shared and now these tools all line up. They all line up each step of the way. Mark DiMassimo: It becomes a system that you can use and frankly I want that Maslow’s chart that I am imagining in the air as you talk. Mark S A Smith: Yeah but it becomes a checklist. Yeah, right. It’s a checklist. Every airline pilot with 5,000 hours still use a checklist on every flight and we as marketers and sales people still have to use a checklist every … I still have my checklist I go through every event. I’ve been doing this a long time but the Maslow’s hierarchy gives us a checklist to make sure that we have a person who is inspirable. We do everything we can to put them into that state. Mark S A Smith: When it comes to … I think this is an important place I want to go is when it comes to helping people with disruptive products, and disruption is all about inspiration, have them see the value of realizing their dreams, a bigger value than the value of the status quo. It’s that transition that’s the magic to getting people to take action and then priorities and we can work with a person to figure that particular part out. I want to share with you this concept of some of the mistakes that I see people making along the way. Mark DiMassimo: You’re talking where I live right now because I have a brand that is all about inspiration. We are growing at an Inc 5,000 pace. We’ll be on it again this year and, as a result of that growth, we are bringing in more sales people, more sales trainers and what the sales trainers are pitching is this pain based sell and it doesn’t feel inspiration to me. Mark S A Smith: Can’t do it. Big mistake. Mark DiMassimo: What do I do about that? What’s the solution if it isn’t pain based selling? Mark S A Smith: Instead, focus on what’s possible. Focus on outcomes versus status quo. Focus on where they want to go, not where they are. Mark DiMassimo: Is that solution selling? Is that possibility solution? Mark S A Smith: It’s even bigger than that. It’s even bigger. It’s outcome based selling. It’s outcome based selling. Mark DiMassimo: Outcome based selling. Mark S A Smith: The problem is that in sales, as in medicine, prescription for diagnosis is malpractice. Mark S A Smith: You’re going to be saying, “Wait, wait, wait. I’m here because I want to run a marathon. I want to make sure that I can do this safely. I don’t need the blue pill, doc, okay?” If you go to the outcome, outcome is Mark wants to run marathons, it’s going to be a different discussion than Mark wants to… whatever. Mark DiMassimo: All right. All right. Help me with this because I feel we’ve really gotten to the crux. This is a beautiful kind of way to close because I feel like we’ve really gotten to the crux of an issue that I am personally facing right now and I know a lot of my clients are, too. We compete in a field where lots of people promise lots of things, right? Lots of people are going out there painting rose gardens with outcomes. Clients or prospective clients tend to turn off quickly as they feel a combination of rosy promises and inauthenticity. Okay, it has to be both. It’s not one or the other. One of the arguments that the solution sellers, that the pain based sellers bring forward, one of the things they say is, “Hey, clients are in pain. Everybody’s talking about rose gardens. Let’s deal with the thorns.” I think I just made that up but that’s in effect what they’re saying. That’ll get their attention. What’s your response to that? Mark S A Smith: Okay. Let me step back a moment and then step back into it. That is, remember, a common belief is that people are more motivated by pain than by desire and that’s true when they’re in pain, yet there gets to be a point where pain based selling stops working and that is as we ascend up Maslow’s hierarchy of needs. You have to ascend from pain based selling to something that is, dare I say it, more loving. Mark S A Smith: When you look at outcome based selling, the problem is that when I do solution selling, I’m still selling a product. I’m still selling a tool. I’m still focused on the how when what I really want to do is focus on the what and why. Inspiration is about what and why. Mark S A Smith: Why is I got to understand there what’s driving them. Are they inspired to do this? Are they motivated to do this? Either way doesn’t matter but I have to understand the why before I can choose the how. Mark S A Smith: That’s a conversation we can have at another time. Mark DiMassimo: Brother, you are explicating what I have felt and I’m sure could not articulate as well. If there’s one thing I know when the prospect, client or whoever ascends from pain to the next level, if you’re still selling pain, you become a pain. Mark S A Smith: They’ll throw you out of their office. Mark DiMassimo: They’ll throw you out of their office or worse. I don’t want to reduce it to just that one situation because I think what you said is applicable across the entire relationship. It goes right to our core point, the point that I try to make again and again which is that your brand and your approach to marketing and selling need to be 100% aligned and mutually supportive. If you are about inspiration or if your why is about outcomes of some kind and your selling process is not true to that, then you have a brand with a lack of integrity and a brand of a lack of integrity is like a building with a lack of integrity. It’s much more likely to fall down than to rise up, right? Mark S A Smith: Yeah and there’s a complete disconnect with authenticity. Keep this in mind, Mark, that the higher you go in your client organizations, the higher they will be in Maslow’s hierarchy of needs. If you’re talking to a low level functionary, pain works. If you’re talking to an executive whose job is to drive and lead into the future, they fire people that create pain. They’re not about pain. They’re about inspiration. They’re about driving forward. Lower in the lower organization, pain works. Higher in the organization, pain fails miserably. Mark S A Smith: Lower in the organization, inspiration’s less effective. higher in the organization, inspiration’s demanded. I have to inspire my clients. I have to. Mark DiMassimo: Because they’re high in their organizations? Mark S A Smith: They’re looking for that inspiration. Mark DiMassimo: They’re looking for that inspiration. Mark S A Smith: They’re looking for people that have the same vision they have and can support that vision and can drive that vision and can give them the tools to articulate that vision as you and I have been doing here. Mark S A Smith: As far down as you can inspire. Mark DiMassimo: All right but then we’re engaged with clients who are more receptive to inspiration at the more senior levels and maybe more focused on day to day pain solving, pain avoidance at the lower levels, is there going to be a disconnect? Is it important within the organization to have people at different levels, I guess is what I’m saying, if you’re a service organization? Mark S A Smith: I think what’s more important, Mark, is to have the understanding and the awareness that there’s time for motivation and there’s time for inspiration. Mark S A Smith: There’s time to take an Excedrin and there’s time to have a glass of wine. Mark DiMassimo: It’s to enjoy the taste, not just for the alcohol, right? Mark S A Smith: That’s exactly right. There’s a time to get out a sledge hammer, there’s a time to get out a paintbrush. The awareness of what to do when is the magic of what we do. Mark DiMassimo: That is a perfect place to end it because there’s a time for ending and unfortunately we’ve come to that time. Mark S A Smith, you inspire me. Mark S A Smith: Thank you. Mark DiMassimo: You do inspire me to transform myself in ways that have and I know will transform my satisfaction, my success, my ability to connect with and inspire others and this is just a pleasure. I know that this is going to be one of those podcasts that people will want to listen to again and again. This has been the Inspiring Action show. This is your host Mark DiMassimo. With me today was Mark S A Smith. We will be together again, Mark, very soon. Mark S A Smith: Oh, so I passed the audition. Mark DiMassimo: We have another program … Yes, with flying colors. With flying colors. You were not at all a pain and you were super inspiring. I think we can safely promise the audience that this is not the last time they get to see the Mark or hear the Mark in Mark’s show. Till next time, inspire action.